Yes I do remember you and I remember being surprised that you had come a long way to arrive at the Otto meet. I hope you can attend our 47th anniversary on May 27. Thank you very much for your best wishes for my wife. We are fortunate that she was not severely impacted and she is gaining better mobility with physical therapy. The forecasts I read for Dockweiler were overshooting the actual. Actual at the site wdsssssssas about 2 to 5 mph. Today's flight time was a late start for me: 3 p.m. to 6:30. A nap under the wing was taken. Pleasant temperature. All the flights were with severe wing runs. Flight ground distances was good and fun. This invited longer carrybacks. Pleasant seeing the bees pollinate the slope's flowers. Joe, you've mastered the secret of life ... enjoying the passage of time (great J.T. song for those who know it). My glider transport machine is almost repaired, and I hope to be sharing the air with you soon. Thanks for the reports ... they always make me smile. Good news about your HG-carrying vehicle! Thanks for all the rides you gave me in it! And the Falcon tips along the way. An exploratory adventure set the scene. Tire from yesterday, I aimed to arrive at Dockweiler early. Had breakfast at Fantastic Cafe in El Segundo. The 9:30 first flight was in 1 mph NW (cross for the slope). Good ground distance. But the wing run on the sandy top launch got the heart going. I was going to attack the world record for flight count, but the low wind, heat, and effects of yesterday's flight were going to have they nay say about the record. But many things were noted that will affect future efforts. Sharpening the mechanics and preparations will making breaking the record more feasible. Today I had the saltines, water, food to guard against cramps; but as the day went on, the way-below-forecasted wind had its special effects. First 14 flight to noon: Wind under 2 and NW. Then wind W to flight #21. 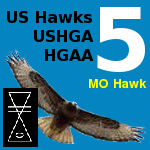 Then wind SW at 4 and 5 mph through flight 33. Then NW wind for four more flights. Done. 1. The launch calories are high. 2. The ground-distance effected is large. This means that the non-assistive wind (no help in carrying the wing's weight) has pilot carry full weight of wing a longer distance; such takes up more calories and muscle wear. 3. 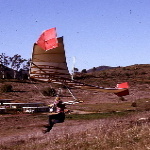 The carrying of the wing up the slope has no assist from the wind. The carefully logged (time of day, wind estimate, and comment) 37 flights of the day maxed my body. The right hamstring was threatening full awful pulling, so I stopped even with time left in the daylight. Ed Vasquez (1974 HG; later some PG; has flown Dockweiler in recent times) stopped his bicycling to chat some; good to see him again. PG-HG shoulder tendon injury gives him some pause of late; but he gets in about 25 miles cycling each day. He ask about Bob and all. Jon Plank, 80, of class 1955 Culver High (my high school, but for me: 1959) has been RC gliding and e-flight operating at Dockweiler. We talked; I showed him the details of what was puzzling to him: a rotating kite that I had going in a pause of my hang gliding session. HG flight session: 9:30 a.m. to 4:32 pm. In the session were pauses for water, food, sitting rest. The seven hour run for 37 flights: a bit more than 5 flights per hour; the record was not going to be broken as leg cramp came and I did not want to risk a full muscle pull-tearing. [ ] Napper in truck needed. [ ] For record, have two days rest prior to the big effort. [ ] Sharpen effort by going for "it" when the wind is assistive. [ ] Cooler days with assistive wind will be helpful. Hot days sap energy. [ ] Keep the water intake robust. [ ] Best effort will possible when sand does not built up inside shoes. Get non-sand-intake shoes. [ ] Design cushioning on harness so there is no irritant from the harness. Such irritants sap calories needed for the record effort. [ ] Get a helmet that ventilate better than the one I've been using. [ ] Configure a quick tie-down that avoids the knot-tying session; perhaps have a loop in the tie down rope and a tie on the basebar with a loop and carabiner. [ ] Aching to fly a better L/D wing at Dockweiler. I ache to fly to the wet sand! [ ] The bluff's moguls: How might we smooth the whole slope? Infill, sculpt, and set plants everywhere. ???? [ ] Incline running board at the top launch might be something to try. [ ] Landing area wind-direction tells. Special: Woman with three young sons ages 3 to 5. She delighted in seeing the HG; several questions answered. She and sons were at water's edge playing; then they took special moment to direct the attention of a flight. I landed; they all ran to the wing in landing area. I field the questions from the three sons. 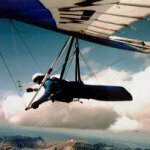 It was their first real-life connection with a hang glider. The three year old insisted many times: "Why do you fly????????" Good question; honest was challenged; but a partial answer: it is really fun. I thanked the mom for sharing her sons; she replied with an invite for me to babysit them anytime. Day after note: Quadriceps are very sore. JoeF wrote: . . . she replied with an invite for me to babysit them anytime. . .
gliding tandem flight at Dockweiler Beach!" My heart aches to get back out there with you again, Joe! Frank Colver wrote: My heart aches to get back out there with you again, Joe! Thanks for the very detailed reports. Your words paint a picture of your activities, and it's fun to watch in my mind's eye. I can't wait until I can join you again. Thanks Scott, Frank, and BobK ! Next Monday and Tuesday: I must be absent for other matters. Even if wind is great. April 16 and 17. Joe & Bob, Sometime in the near future I'm going to go to Dockweiler when Windsports is open to deliver the wheels I repaired for them. If either of you want to make some potentially low wind flights before Windsports opens on one of their regular days I could get there early and then head back home early, after they open, to take care of my duties there. I see nothing in the agreement with B&H that prevents flying any time that the concession is not open for business. It's just that there usually isn't much wind before noon (which is why they open then). By my being there I could bring the 330 to help with the low wind conditions. We could pick a date based on my availability and forecasted wind conditions. Springtime can bring some early west winds. BTW - Last full week in April I'll be busy mornings, in Anaheim, helping Reluctant Sparrow with his harness prototype build. Good. I'll watch for the day you announce, Frank; I'll aim to be there and fly your Condor when no business operation is occurring. I've been launching the Alpha 210 in 0 to 1 cross; the Condor will be more easily launched. such was the concession's understanding as you expressed, Frank. Amen.